Mehboob Restaurant serves all kind of Pakistani Food. It also serves Yummy's 36 Ice Cream. 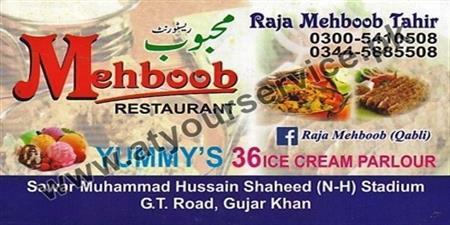 Mehboob Restaurant is located near Sawar Muhammad Hussain Shaheed Stadium, GT Road, Gujar Khan. It serves all kind of Pakistani Food. It also serves Yummy's 36 Ice Cream.